Toshiba Imaging Systems Division, the global leader in high definition (HD) camera technology for broadcast, scientific, industry, and defense applications, announces the recent use of the tiny, IK-HD1 high definition cameras as part of a camera rig that captures background plates for feature films. 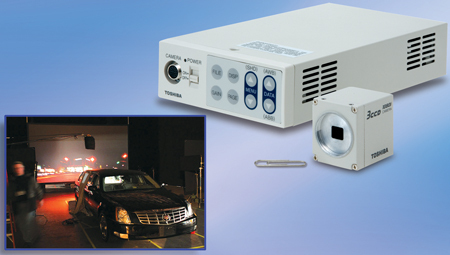 Experts at 24frame.com, a Southern California-based company that specializes in HD projection car process playback, selected Toshiba Imaging's high def cameras to capture day/night moving plates to be used for feature film projection playback. According to Robert Chartier, CEO of 24frame.com, "We tried using several other HD cameras to shoot background, day/night plates for HD playback later, and found that the miniature IK-HD1 cameras were superior – they are surprisingly accurate, even at night. The day plates were fantastic and all the plates shot with Toshiba's IK-HD1 were well-suited for use in feature films. In other words, the quality of the plates met or surpassed the image quality required for projection onto an 80-foot feature film screen exceedingly well. We are delighted to integrate this new, miniature HD camera technology into our state-of-the-art camera rigging." In addition to feature films, 24frame.com also specializes in capturing process plates for projection playback on set for TV shows such as "Glee", "Monk", "Desperate Housewives", "Castle", "Melrose Place", and many more. Toshiba Imaging's suite of five, ultra-compact, high definition cameras includes both 3CCD and the more affordable CMOS sensor models. A variety of selectable outputs and remote head features make the family of HD cameras ideal for any broadcast application (sports, reality TV, 3D production, etc.). Other applications include life sciences, aviation/aerospace, machine vision, military and defense, diagnostics and microscopy. Toshiba Imaging Systems Division (Irvine, CA) is the premier supplier of high quality video cameras for machine vision, R&D and scientific applications. Advanced video imaging technology and high resolution cameras such as Toshiba's 3CCD color cameras and their remote head camera family has earned Toshiba America's Imaging Systems Division the distinctive reputation for offering the most advanced imaging solutions to the industrial and scientific communities. For more information, please visit www.cameras.toshiba.com.